We may have scored HTC's latest Android-infused device for a brief window of time, but if you're hoping to snag one for keeps, you'll need to jet over to the UK and sign away your cellular soul to Orange. Based on a brief but pointed tweet from a carrier representative, the HTC Hero will be "available from Orange UK retail stores [starting] tomorrow." The phone is already up on the operator's website in a delightful graphite hue, and the price of £0.00 on a pay monthly contract sure is luscious. So much for T-Mobile Germany getting a jump on everyone, huh? 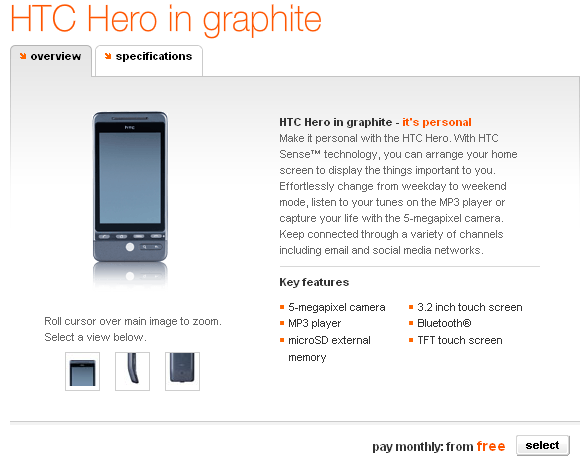 HTC Hero on sale tomorrow at Orange UK originally appeared on Engadget Mobile on Tue, 21 Jul 2009 15:02:00 EST. Please see our terms for use of feeds.